Introducing our new range of fabulous Glass Tile Pendants! These make a beautiful personalised gift. The process is simple - print a photo/image on glossy paper (or cut an image out from a magazine). Put a tiny drop of clear-drying super glue on the back of the glass cabochon, then apply the image. Allow to dry (apply pressure). Then put a small drop of super glue into the pendant tray, and drop in the glass tile - apply pressure and allow to dry. Bronze Toned Filigree Tray for a 18mm round cabochon. Sold per set of one pendant base and one clear glass cabochon. 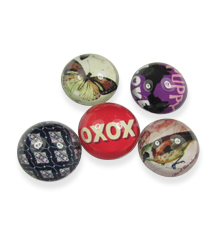 The cabochon is 10mm and the pendant measures 32x30mm. Sold per set of one ring and one clear glass cabochon. The ring is adjustable, and the tile is 25x18mm. Ring is brass. These are a bit of fun! Cute designs, selection is completely random. Sold per bag of 5 cabochons.